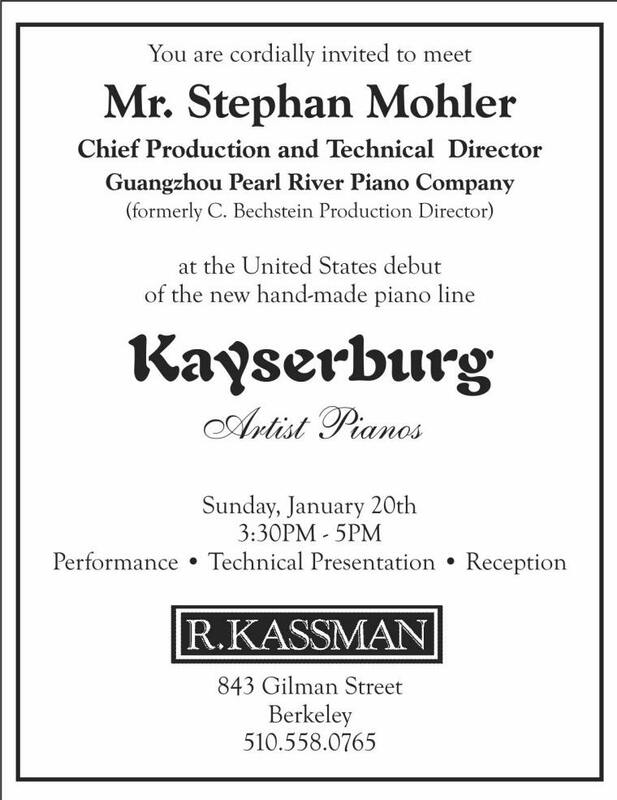 Swiss piano expert, and Guangzhou Pearl River piano production director Stephan Mohler will present the new Kayserburg Artist piano line in its USA debut at R.KASSMAN piano on Sunday, January 20th. Mohler, the former Chief of production for C. Bechstein pianos of Berlin, Germany, will present the product details of the recently designed pianos by famed piano designer Lothar Thomma at a performance, presentation and reception featuring the new instrument. To build this instrument, Mohler created a “factory within a factory” at the Guangzhou facility, personally selecting the craftsman to work with him to build the pianos in the European guild system. This means that each instrument is built by a team of individuals from raw product to finished instrument. The pianos, being introduced to the American market at the 2013 National Association of Music Merchants convention in Los Angeles in January, are each hand-crafted and feature solid spruce soundboards, Renner (Stuttgart, Germany) action components, genuine Ebony sharps and patented keytops of mineral components nicknamed “Ecory” (Eco-Ivory). R.KASSMAN was selected as the first Kayserburg dealer in the United States by Pearl RIver America president Evelyn Luo in a “test market” of how the instruments would be received. Based on response, the instruments will be distributed nationwide beginning in January of 2013.